Sacrifice is integral to the success of popular fiction. The black moment, the climax (most especially in a romance) comes down to that moment when all is lost, everything the protagonist believes or wants is out of their reach and they must make a choice. In that choice is the sacrifice that drives the happy ending. Can you have an ending without a huge sacrifice? Of course. But those are the books that will be donated to the library or traded into the used book store because the story lacks the intensity that we as the reader crave. We want the characters to be tortured. We want them to have to make a personal choice. To chose a path that ascends higher than their own aspirations and benefits their lover more than themselves. The lure of a partner who will place you above all others, above their own needs and desires can be seductive. That choice draws us into the fictional world, and we can live vicariously and spiritually through the character who makes the difficult choice. I remember clearly the first time I read (a very simplistic version) of sacrifice. 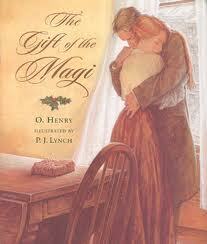 O. Henry’s Gift of the Magi used to be required reading in middle school (sadly I don’t believe my kids have read it). To my young romantic self, destitute Della and Jim’s secret sacrifice of the one material thing they held dear in order to buy a Christmas present with meaning was epic (even though the point my English teacher was trying to emphasize was irony). Clearly I was destined to write romance. Now my yearning for that kind of sacrifice is much more sophisticated. And when I analyze my ‘keeper’ books on my book shelves, the books that I read over and over are riddled with characters making agonizing choices in the face of seemingly insurmountable problems. Fiction allows us to live those sacrifices, to agonize and fear the outcome, and do it anyway. And hopefully, if done well, fictitious sacrifice gives us the courage to face our own choices with knowledge, foresight and hope. And bring that sense of satisfaction to our own lives. I felt the SAME way about the Gift of the Magi. Oh, the heartache! The Gift of the Magi is one of my favorite short stories. Another great short story where the black moment turns on a moment of self-sacrifice (to save a woman's honor) is Mr. Know All by W. Somerset Maugham. What a beautiful post, Lisa. I think this is why I still love the stories that I loved growing up. I always think of Little Women. Sometimes life is going to be scary or frustrating or heartbreaking, but even knowing that, it is better to share your love with those around you. I'm aboard the Gift of the Magi bandwagon as well -- and like you, I always saw the romantic notion of self-sacrifice more clearly than the irony of the story. I love that you pointed this out, the difference between "keeper" books and those that are just okay -- because yes, it is that heart-pounding moment of love to the point of sacrifice that makes the best books sing. Rachael, Mario and Juliet--Isn't interesting that Gift of the Magi still resonates *years later*? Mario--I'll have to check the Maugham story out. I'm not familiar with it. Adrienne--Oh, Little Women. I cried and cried and cried. *loved* that book. Oh yes, the Gift of the Magi. Sigh... Do English teachers really think the point is the irony? Maybe that's why irony isn't understood as well as it should be. It's definitely the sacrifice. Um....off to google Gift of the Magi...DON'T KICK ME OUT OF THE GROUP WHILE I AM GONE! The "Gift of the Magi" made me cry when I first heard it read out loud. That might have been in fourth grade. I was so mortified to have cried at school I decided I hated that story. Ah, the logic of a nine-year-old. Martha, I warn you, you may think it's sappy. But I dare you not to feel at least a pang of something.